GREATGOLD – The Rock and Roll Hall of Fame has announced the 2019 inductees to be honored in a ceremony next year. They are The Cure, Def Leppard, Janet Jackson, Stevie Nicks, Radiohead, Roxy Music and The Zombies. Most of those to become immortalized in the Rock Hall were overwhelmingly approved by fans who participated in the online FANVOTE at the Rockhall web site in the weeks leading up to the announced winners. Sometimes in the past, the FANVOTE gave everyone an inkling as to which musical professionals may be inducted the following year. The FANVOTE top five is not always, necessarily, the final five from the fifteen performers nominated, but in this case, it came pretty close. The five most popular at the conclusion of FANVOTE are, from number one through five: Def Leppard, Stevie Nicks, Todd Rundgren, The Zombies and The Cure. The FANVOTE was combined with the results of the official voting members of the RockHall Inductee selection group. The overall results determined the seven finalists announced by the Rock and Roll Hall of Fame at Cleveland, Ohio USA. The induction ceremony will take place during the Spring of 2019, but the music of the winners can be heard right now and everyday in the mix at GreatGold.fm Internet Radio. The 34th Annual Rock & Roll Hall of Fame Induction Ceremony, presented by Klipsch Audio, will take place on Friday, March 29, 2019 at Barclays Center in Brooklyn, New York. The Rock Hall will unveil its 2019 Inductee exhibit at the Museum in Cleveland, Ohio in conjunction with the celebration. The 2019 Nominees, and other Rock and Roll Hall of Fame inductees inducted since the start of the Hall of Fame, are in the GreatGold library of music in the http://GreatGold.fm internet radio music mix from the 1950’s through the 2010’s and beyond. You can listen directly at the http://GreatGold.fm website, or search for ‘greatgold’ in internet radio mobile Apps, like TuneIn, NoBex, SimpleRadio, and in online Directories, including http://Internet-Radio.com, McStreamy.com, Clik2Go.com and others. LOOKING FOR MUSIC BIRTHDAYS? See the complete list of Singers and Musicians born this month who are getting Extra Plays, due to being born this month. CLICK/TAP HERE FOR CURRENT BIRTHDAY STARS LIST. 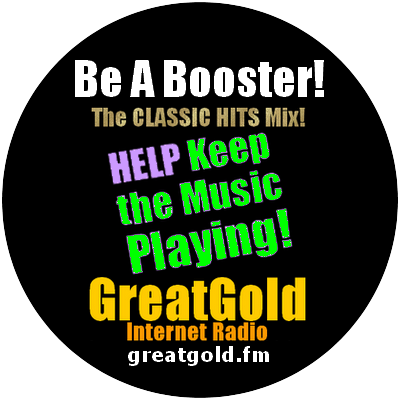 Where Can You Hear GreatGold Classic Rock & Oldies Now? Turn Yourself On With GreatGold In October!